Last edited by Terry Colley on Sun Feb 14, 2010 4:31 am, edited 3 times in total. Last edited by Doug Bernhardt on Sat Feb 20, 2010 11:37 am, edited 1 time in total. Last edited by Doug Bernhardt on Mon Feb 15, 2010 8:31 am, edited 1 time in total. The Vines Pub also in Liverpool. Two sides of the same fireplace. I have updated the map again. Doug could you check if the adresses of some of the pubs in London is correct? I tried to find the Mooneys but could not find the adress. Where are the masterpieces of North America to be seen? Shall I put the sign museum up as an location? This little gem is in a run down part of town, most of the shops and houses around it have been demolished so I think this must have a preservation order on it. Whist there are a few ceramic tiled pubs around most do not have the original lettering mainly due to changes in brewery ownership and name changes. a few years ago they took a pub like this down tile by tile and reconstructed it a Manchester airport (terminal 1 departures) No art and craft inside! Is that a little Doug I see in the punties of the last photo? Photo's look very nice, thank you. Thought a few more were worth adding here. Seeing Dave Smith's addition about the Tottenham in London brought these to mind. The second is at The Elgin in Ladbroke Grove London...which also is just around the corner from where Reginald Christie did his deeds if you're interested in true crime. The first is at the Boleyn also in London. It is at the site where Anne Boleyn lost "er ed" after frustrating Henry the 8th's ambitions. A must see, one of the most beautifully decorated glass panels. It is to be seen in a room named the 'Spiegelkabinett' wich is fully packed with glass panels, framed in gilded roccoco framing. This room can be found in the Residentz palace of the north Bavarian city Würzburg. Short history found on wikipedia: "As a result of a devastating air raid on March 16, 1945, the Residence was almost completely burnt out and only the central building with the Vestibule, Garden Hall, Staircase, White Hall and Imperial Hall survived the inferno, their roofs destroyed. From the attic the fire ate down through wooden ceilings and floors, and all the furnishings and wall paneling which had not been stored elsewhere were devoured by the flames. Much of the furnishing and large sections of the wall paneling of the period rooms had been removed in time and thus escaped destruction. Neumann's stone vaults withstood the collapse of the burning attic. However, because the roofs had gone, further damage was incurred in the ensuing period due to dampness. In the Court Chapel, for example, the most of the ceiling frescoes by Rudolph Byss succumbed to the subsequent consequences of the fire in spite of the intact vault and had to be laboriously reconstructed. From 1945 to 1987 the building and its interiors were reconstructed to their current state. The rebuilding cost about €20m Euros". The wall decoration of the Mirror Cabinet, completed between 1740 and 1745 and the most precious interior created in the Würzburg Residenz under Prince-Bishop Friedrich Carl von Schönborn, was completely destroyed in the bombing raids of 1945. Based on a preserved mirror fragment, numerous photographs and a watercolour by Georg Dehn (c. 1870/73), the entire room shell was however recreated between 1979 and 1987, using the old techniques. This reconstruction, together with the rescued furnishings, gives visitors an idea of the overwhelming effect originally produced by what was perhaps the most original example of interior decoration in the Würzburg rococo style. Detail of the painting on the wall of the Mirror Cabinet. Mirror cabinets are found in numerous German baroque and rococo palaces. They are usually panelled rooms with inset mirrors, carvings and stucco-work, where porcelain was frequently displayed. The walls of the Würzburg Mirror Cabinet, however, consisted entirely of glass panels, which were prepared on the back using a special technique: either paintings were produced on the partially recessed mirror ground, or drawings were engraved into a gold ground that was applied on the back of the mirror and then underlaid with dark gloss paint. By this means, instead of displaying Oriental porcelain figures in front of the mirrors as was customary, a rich array of exotic figures and scenes could be incorporated directly into the mirrors. Here are some pictures from one of my favorite stores in Florence, Italy. Located on the Arno river beside the Ponte Vecchio, Papini Leather Goods had a great logo, finely gilded windows and a gilded leather ceiling. The business was started in 1896 and the window gilding was done in 1929. Wood carving of Papini logo. Close up of Papini lettering. Close up of Papini logo. 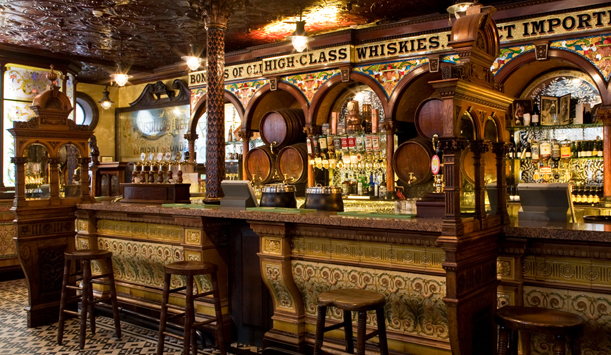 The Crown Bar in Belfast, near where I grew up, is stunning inside and out. And the Palace Theatre in Plymouth where I live now. This beautiful building was turned into a nightclub, and is now derelict. I would love to try to help save it. Traditional Signwriter and Illustrator working in Plymouth, UK. I know this is an odd one to add to the "Masterpiece" collection but I think it is an incredible piece with probably an authentic representation. Naive but rich. Found it in a small village in Scotland. This is Star and Garter in Soho, London England. You see a lot of these glass fronts with metal letters mounted behind. I thought I should get this one posted as you never know when it will simply disappear. Here are a couple photos from the Blue Last in London England. It's always hard to sort out fact from fiction but if I recall, this piece was rediscovered after WW2 when a wall that had been installed to protect it was pulled down....to everyone surprise including the owners. Since we're in the mood for glass work and everyone loves them, these are from the Dog and Duck also in downtown London. There obviously were 3 of these panels at one time but I'm guessing wear and tear has taken it's toll. These 2 photos are from the Bunch of Grapes just off Old Brompton Road in London as well. It has been my favourite pub to visit and been there many times. There is a treasure trove of antique details and many pieces of glass from all different manufacturers. This one is a remarkable survivor especially considering it's outdoor location. Since I'm on a roll here....how about a carved letter from the Edgar Wallace and a glass piece from the centre of the back bar at the Museum Tavern in London. This pub is at risk of being demolished because of it's location and low level of trade I'm thinking. Is just around the corner from the British Museum (prime real estate) and a small pub at least by North American standards. Sad to think that some of these pubs are going away in the name of progress. Such a loss. all the skills that created them so long ago. I tip my hat to you mate! I remember that one also on my London glass quest, a stupid little mis-hamered nail of the frame broke that treasure. Hello Eric. Your work is beautiful and exceptionally well crafted. May I ask, do you use screenprinted back-up black and screen printing in your work? Thank you. Keep up the fine work.